Oil and stock indexes (such as the TSX Composite) are gauges that can be used for picking individual stocks. Since certain stocks will perform better than these benchmarks, and other stocks will perform worse. We want to find the ones which show the most promise. This is done by comparing the price action of individual stocks to oil and stock indexes. Oil and stock indexes are highly correlated (move with each other) over the last decade. This was not always the case, pre-1999 oil and stock indexes had a very tenuous correlation, often moving inversely. By using both oil and stock indexes we can improve our chances of picking quality stocks. Here is a recent example: Canadian Energy Services (CEU.TO) has performed better — in percentage terms — than oil and the TSX Composite over the last year. Recently when the oil and stocks declined rapidly in early August, CEU.TO sold off as well. The interesting thing is that while the TSX and oil made new lows for the year, CEU.TO did not even make it to the low it saw in June. (Disclosure: CEU is an OGIB stock, and Keith Schaefer owns shares). Figure 3 shows this visually. 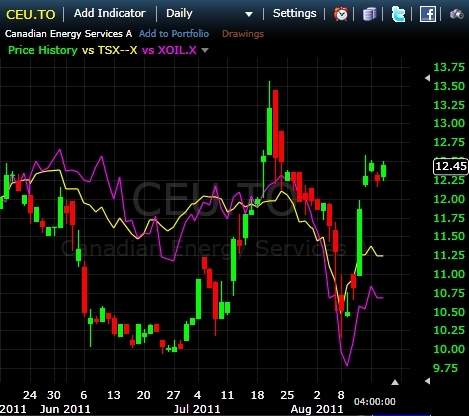 CEU.TO is the green and red bars, oil is the purple line and the TSX is the yellow line. Figure 3 shows an example of the type of action we are looking for. By finding stocks with similar patterns over the long-term, positions can be taken for when equities and oil begin to trend higher once again. That trend may be some months away as there exists the potential that stocks and oil continue to move lower over the next several months. CEU.TO is a short-term example, but as the stock market and oil continue to decline (in my opinion) what are we looking for down the road? 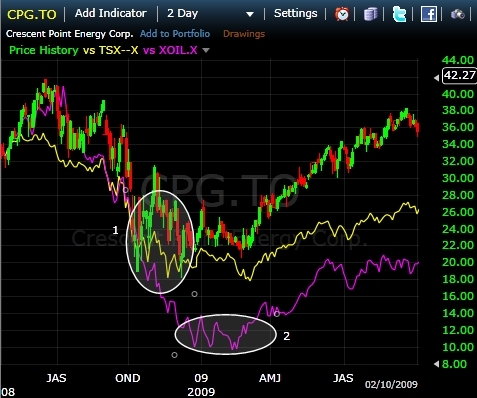 In the 2008 decline CPG.TO showed great strength as oil and the TSX Comp continually made new lows. Figure 4 shows CPG (red and green bars) vs TSX (yellow line) and Oil (purple line). CPG made lows in early December of 2008 (circle labelled “1”), and oil and stocks continued to decline into February and March respectively. The fact CPG would not go lower as these two benchmarks went lower was a signal to buy the stock. Be afraid of stocks that have been hit and hard and continue to fall. Love stocks that have fallen and stopped falling as oil and the broader market continue to decline. This shows selling is exhausted and any positive news or push higher in oil prices, stocks or the sector will raise the price of the stock. Its fracking fluids can also be recovered quickly and easily. And — when the fracking is completed — oil producers can increase the amount of oil produced by using this company’s unique technology. That’s why a prominent North American financial services firm maintains an “outperform” rating on this company. Learn all about this company — the “horsepower” behind one of the world’s fastest-growing sectors — here in this free video. Exploration/Production or Services – Is there is there a return advantaged sector? On a final note, I wanted to look at the performance of the Oil Services Sector and the Oil Exploration & Production Sector to see if there is an edge to be had by one or the other. Both sectors are highly correlated to each other and to oil. The only real difference is slight-moderate variations in performance. In early stages of an uptrend in oil prices the Service sector performs very well. At the major low price in oil prices in January 2009, the Services hit bottom first (December 8, 2008) and showed early strength. Exploration/Production bottomed 3 months later but caught up and two sectors moved in virtual lock step to the recent April, 2011 highs in oil and the sectors. Over the last 12 months and also year-to-date, Services have been outperforming, indicating a shift may be occurring and Services may begin performing better during all stages of the oil trend. Any stock can outperform at a given time, but there is evidence there may be a slight performance edge in the Oil Services sector. Not only does the sector as a whole usually bottom first, but it is now performing well across all stage of oil bull markets. Stocks that bottom early and stop falling as oil continues to decline are exactly the type of stock you are looking for to buy. Oil and the stock market are correcting and there is potential of a recession. This provides a great opportunity over the next several months to begin looking for oil related stocks which are no longer moving lower, even though crude prices and the stock market indexes may continue to decline. This is called “relative strength.” It is a sign that this stock is strong and if it can’t fall even when market conditions are unfavourable it means the next likely direction is up. The more companies we see that start to show relative strength to crude and stock market indexes falling the closer the markets are to a full reversal. The Oil Services sector as a whole generally bottoms before oil prices, therefore looking for stocks within the sector that hold their ground will likely provide positive returns when oil and stock indexes begin to move higher. Regardless of where oil prices or stock indexes go, it is always advantageous to buy stocks which have relative strength. Disclaimer: The information provided is as of the date above and subject to change, and it should not be deemed a recommendation to buy or sell any security. Trading involves substantial risk and may not be right for everyone. Certain information has been obtained from third-party sources we consider reliable, but we do not guarantee that such information is accurate or complete. Disclosure: Cory Mitchell does not own shares of any companies mentioned, nor does he have a current position in the oil market. Keith Schaefer owns share of CEU.TO.